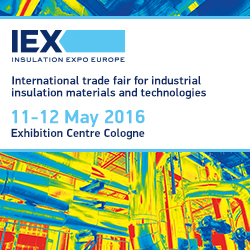 The IEX – Insulation Expo is approaching! In two weeks, from 11-12 May, the leading trade fair for insulation takes place at the Exhibition Centre in Cologne, Germany. Come and visit us in hall 8, stand nr. 164 and discover our thin reflective insulation Aluthermo. IEX-Insulation Expo is the leading trade fair for insulation material and insulation technology and offers for both, exhibitors and professional visitors, a high-quality platform, where existing business relationships can be intensified and new business contacts can be acquired.